Naamashkaar.......Greetings from Mandore, India, Our home for the duration of the village project. We arrived yesterday and were greeted with a warm welcome of flower garlands and traditional music from Surendra (the director of the Marwar medical relief society) and his family. The thatched huts and swinging beds in the garden were a real contrast. Here's a status report of the village project. Currently having a brilliant time and loving India to its fullest extent. Happy reading and enjoy! Greetings from Mandore! The village project is in full swing and the second week has been as rewarding if not more so than the first. The group is now settled into the early routine of waking up, breakfast and cycling and a lot of us have been getting fitter for the better. Cycling 22 km a day for the last two weeks has made the group feel healthier since the first 2 weeks were spent "bus" ing around the sights. Whenever we reach the village project we are always eager to crack on and dig in with the many activities and tasks which need to be done. This week was quite exciting as we started a new phase of the project, the school. The school has around a hundred pupils from the local village and has very basic ground: a well, a few classroom buildings and no electricity. There were numerous jobs that needed to be completed and a huge variety of skills was required from the group. Firstly, the ground was leveled out to create flat surfaces in the school grounds and enabled other jobs to occur. A volleyball pitch was constructed by a small team of venturers and a pretty little garden was planted with various species of flowers. Inside the School "Leader" Nick and Dave aided the local electrician in electrifying the school sorting the children out with lights and A/C fans. Surendra our project manager was helping to direct us at this time and we were always able to find ourselves jobs to keep us occupied. Benches and tables were made, bolted together and painted. A small group of venturers helped in a school survey of each child finding their height, weight and many other various criteria. This survey was then used by local doctors to see how the children are developing and to see how healthy they are. The school buildings were repainted, all the way to the outside walls to the classroom doors. There was so much activity in fact, that we attracted local dignitaries on two separate occasions! These dignitaries brought a hoard of people from the local community to watch what was going on at the village and media interest to the Venture Co, team. We were featured in two local papers reporting what we are doing at the village. 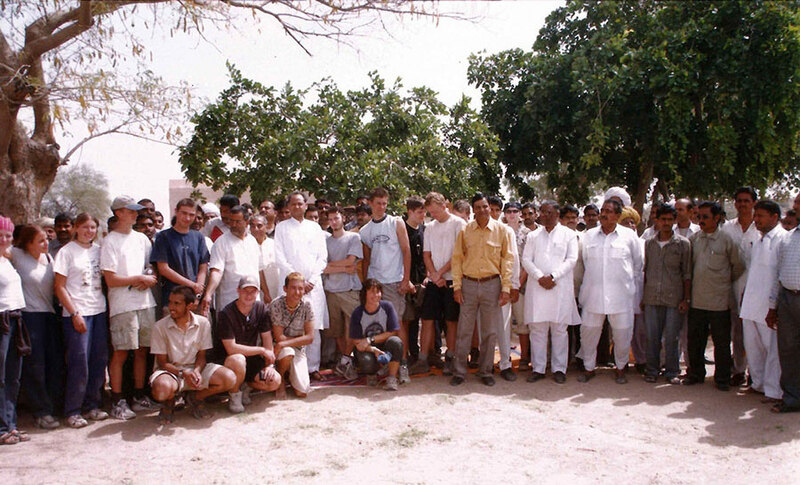 This press coverage was most unexpected and the locals in Jodhpur started to notice the work we were doing. Hopefully this attention will not go unnoticed and may be the Vishnoi villagers will get some more support from the Rajasthan Government. It seems over the last week we have made a radical change to the community for the better. Working with the Vishnoi people to reach a common goal has installed a sense of pride and achievement in all the venturers to the realization that we have made a real difference.